The small town of Chamba is located in a picturesque valley, amidst the Shivalik ranges and is famous for its medieval temples. Chamba is bounded on north-west by Jammu and Kashmir on the north-east and east by Ladakh area of Jammu and Kashmir State and Lahaul and Bara-Bangal area of Himachal Pradesh, on the south-east and south by the District Kangra of Himachal Pradesh and Gurdaspur District of the Punjab. In circa 500 A.D., a legendry hero called Maru migrated to north-west and founded Brahamputra (Bharmour) 75 kms to the east of present Chamba town. His successors continued to rule over the country from that capital city for over three hundred years until Sahilla Varman shifted his capital from Brahamputra to the more centrally located plateau in the lower Ravi valley. He named the town after his beloved daughter Champa. The layout of the plan of Chamba seems to be in conformity with the ancient texts. From then on the rajas of Chamba continued to rule from here in an uninterrupted and direct line of descent. The Muslims never invaded Chamba, though it had its occasional fights with the neighboring states in the hills having similar cultural background. Thus, the damage to Chamba from these invasions was seldom serious and never beyond the possibility of repair. Even the powerful Mughals were kept at bay on account of difficulties involved in communications and long distances. Aurangzeb once issued orders to the Raja of Chamba Chatter Singh (1664-1694AD) to pull down the beautiful temples of Chamba. But instead the raja in clear defiance to the Mughal ruler placed glided pinnacles on the temples. On the whole, the area experienced comparatively peaceful condition during the Mughal regime. Raja Prithvi Singh (1641-1664 AD), a handsome and a gallant knight was favourite of Shahjahan and visited the imperial court many times. He introduced the Mughal style of court life including Mughal-Rajput art and architecture in Chamba. By the last quarter of 18th century, the Sikhs forced the hill states to pay tribute to them. After Ranjit Singh’s death Chamba became un-protected and was drawn into the vortex of the disintegration of the Sikh Kingdom. The Sikh army invaded the British territory in A.D. 1845 and the troops of Sikh army, which were stationed in Chamba, were withdrawn. When Sikh’s were defeated it was decided to merge Chamba in Jammu and Kashmir but on account of the timely intervention of Wazir Bagha (of Chamba) it was taken under the British control and subjected to the annual tribute of 12,000 rupees. The Rajas who saw something of British hegemony were Sri Singh, Gopal Singh, Sham Singh, Bhuri Singh, Ram Singh and laxman Singh. Their relations with the British political officers seem to be cordial and Chamba witnessed many reforms. On 15th April 1948 merging three principal states formed A.D. Himachal…. Chamba, Mandi-Suket, Sirmour and all the other states falling in Shimla hills. Before Raja Sahilla Varman came on the scene the Chamba region was divided into bits and pieces of territory called Rahnu occupied by numerous Ranas and petty Chieftains who carried on relentless warfare with each other. Raja Sahilla Verman subjugated the Ranas and unified the territory. Rajas, therefore, for better administration divided Chamba into five zones known as Mandlas. These Mandlas were later reamed as Wizarats. This five fold division of Chamba region continues till today. The Wizarats are now called Tehsils. These are Bharmour, Chamba, Bhattiyat, Churah and Pangi. The region situated between Dhauladhar and Pir Panjal is called the Chamba valley while the area lying between the Great Himalayan Range and Pir Panjal comprises Pangi, Lahaul and Spiti valleys. The picturesque Chamba valley is the home of a number of important places like Dalhousie, Khajjiar and Bharmaur. Chamba is also known for its festivals. The Sui Mata festival is held for four days in March/April every year in memory of princess Sui, who gave her life to protect the people of Chamba. Women in Chamba revere her and her image is carried from the Old Palace (Rangmahal) to her small shrine accompanied by singing and dancing. The Minjar festival is celebrated in late July/early August every year. The origin of this festival goes back to the 10th century AD. This festival marks the harvesting of the annual maize crop. It culminates with a procession to River Ravi and throwing of the silk tassels or Minjars (representing sheaves of maize), worn by men and women into the river. Chamba offers many exciting treks over the Dhauladhar and Pir Panjal ranges. 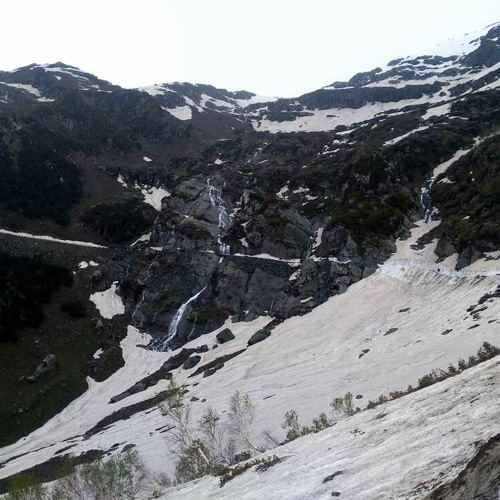 Some of the treks from Chamba are to Killar over Sach pass, and then to Kishtwar in Jammu and Kashmir or to Manaii via Udaipur in Lahaul; Bharmaur to Triloknath/Udaipur over Kalicho pass (4803m); to Udaipur over Chobia pass (4966m), to Manaii over Kugti pass (5040 m) and to Manimahesh lake (4172 m). Duration of these treks which are operational from June to October is 5 to 8 days. Chamba is also a base for (out and back) one-or-two day delightful treks. These are to Jhamuar, Kandi-Bassu and to Khajjiar. Chaugan: A grassy land, 805 m in length and 73 m in width, is the principal centre of social and cultural activities in middle of Chamba town. Apart from being the venue for the annual Minjar mela, Chaugan is also used by Gaddi tribals for camping, and the local people for taking a walk. According to Dr. J. Hutchison, “The town is built on two terraces. On the lower is the Chaugan, a fine grassy sward, about a half a mile long and eighty yards broad. Tradition is silent as to its use as a polo ground and the name is etymologically distinct from Chaugan, the Persian name of Polo, being of Sanskrit origin and meaning ‘four-sided; Besides being a public promenade and recreation-ground, the Chaugan was utilized for State Darbars and sports”. These large spaces are unique of their vastness in a hill station. In the 1890 the leveling of Chaugan was done. It become a public promenade and Cricket ground for the British. During Minjar fair, the Chaugan is converted into a Bazaar. Local people including men, women and children can be seen promenading in the chaugan till late night. Chaugan is closed for public after Dushera to April to carryout maintenance. Laxmi Narayan Temple: Laxmi Narayan Temple, which is the main temple of Chamba town, was built by Sahil Verman in the 10th century A.D. The temple has been built in the Shikhara style. Laxmi Narayan Temple has a Mandapa like structure also. The wooden Chhattries, the wheel roof, atop the temple were in response to the local climatic conditions as a protection against snow-fall. There are several other temples within this complex. Some temples were erected as late as 1825 A.D. by Rani Sarda, queen of Raja Jeet Singh. The temple of Lakshmi Narayana continued to be embellished by the Rajas who succeeded to the throne of Chamba. Raja Balabhadra Verma perched the metallic image of Garuda on a high pillar at the main gate of the temple. Raja Chhatra Singh placed gilded pinnacles on the temple tops in 1678 as a reaction against the orders of Aurangzeb to demolish the temple. Champavati Temple: This temple is dedicated to the patron deity of the Chamba town, Goddess Champavati. As mentioned earlier the temple was built by Raja Sahil Varman in memory of his daughter Champavati who is believed to have influenced her father to set-up Chamba at its present location. The temple is in the Shikhara style with elaborate stone carving and the wheel roof. The size of this temple is equivalent to the largest of Laxmi Narayan Temple. Vajreshwari Temple: This ancient temple is believed to be 1000 years old and is dedicated to Devi Vajreshwari- the Goddess of lightning. The temple is situated on the northern most corner of the town at the end of Jansali Bazaar. No historical record of the temple is available. However, people believe that the temple is around 1000 years old. The temple is built in the Shikhara style with wooden Chhattries and stands on the platform. The Shikhara of the temple is elaborately carved. There are two other minor temples on either side of the main shrine. Sui Mata Temple: The temple is dedicated to the sacrifice of a rani who laid down her life to ensure that Chamba did not go waterless. The temple is located on Shah Madar Hill. There is also a fair organized every year from 15th of the Chait to the first of Baisakhi. The fair is specially important for the women and children. They sing devotional songs in praise of the rani extolling her supreme sacrifice for the betterment of the people. According to the legend, when Raja Sahil Varman founded the town and made this aqueduct for water supply to the town, the water refused to flow. It was ascribed to supernatural causes. It was prophesized that the spirit of the stream must be propitiated. The Brahmins, on being consulted, replied that the victim must either be the Rani or her son. Another tradition runs that the Raja himself had a dream in which he was directed to offer up his son, where upon the Rani pleaded to be accepted as a substitute. Thus on an appointed day the Rani along with her maidens was buried alive in a grave. The legend goes on to say that when the grave was filled in the water began to flow. In memory of her devotion a small shrine was erected at that spot. Chamunda Devi Temple: The temple, dedicated to the wrathful form of Goddess Durga, is situated atop the Shah Madar hill. This temple can be approached by road from Chamba (3 kms). The temple has artistic carvings on its lintel, pillars and the ceiling. A small temple dedicated to Lord Shiva also stands right behind the main Chamunda temple. From this platform, you can also catch fantastic views of other temples and landmarks of the town. Because of this reason, the temple is also a pretty well known picnic spot of the town. Currently, the temple is under the protection of the Archaeological Survey of India. The temple is an ideal picnic spot throughout the year because it has an easy approach and a commanding view. Hari Rai Temple: This temple is dedicated to Lord Vishnu and has a beautiful bronze image of the lord in its interiors.This temple lies in the north-west corner of the main Chaugan, which had become the official entrance to the town by the end of 19th Century. The construction of the temple, dating back to the 11th century, is credited to Salbahana. The temple itself is constructed in the shikhara style, like most of the other temples in Chamba. Standing on an elevated platform, it is the only temple that is close to Chaugan. The temple of Hari Rai is believed to be of great antiquity and legend affirms that the Ravi once flowed in a shallow stream across the Chaugan and the temple had to be approached by stepping. Akhand Chandi Palace: Construction of this residential building of the Chamba family was started by Raja Umed Singh sometimes between 1748-1764 AD. The place was rebuilt and renovated during the reign of Raja Sham Singh with the help of British engineers. The Darbar Hall (Marshal Hall) was built in 1879 by Capt. Marshal and the Zanana Mehal was added in the reign of Raja Bhuri Singh. The subsequent additions and alterations clearly betray the Mughal and the British influence. In 1958 the Palace building was sold by the descendants of the royal family to the Himachal Government. The latter handed it over to the Education Department for the purpose of starting a Government College and District Library. The beautiful structure of the palace with its painted walls and glass work, ceiling, intricate woodwork is fast deteriorating, since sufficient funds are not available for the maintenance of this monument. The palace has a commanding view of the Chaugan, Laxmi Narayana Temple, Sui Mata, Chamunda Devi Temple, Rang Mehal, Hari Rai Temple and Bansi Gopal Temple. Rang Mahal: One of the largest monuments, Rang Mahal is located in Surara Mohalla. The foundation of Rang Mahal was laid by Raja Umed Sing (1748-1764). The super structure of Rang Mahal, which is in brick, belongs to a later date with its southern portion built around 1860 by Raj Sri Singh. The architecture of Rang Mahal is an amalgam of Mughal and British styles. This palace was the residence for a branch of the ruling family. Its fort like looks justifies its use as royal granary and treasury which is on its western side. A number of decorative and colorful wall paintings have been removed from the palace and have been taken to National Museum of Delhi. Some of the wall paintings and richly painted doors of the palace can be seen preserved in the Bhuri Singh Museum of Chamba. Bhuri Singh Museum: The museum, named after Raja Bhuri Singh, was formally inaugurated on the 14th of September in the year 1908. Bhuri Singh himself gave his family collection of paintings to the museum. Apart from the paintings, other items on display are the the embroidered Chamba rumaals (handkerchiefs), coins, hill jewellery and costumes- both traditional and royal, arms and armour, musical instruments and various decorative objects.The old museum building which merged well with the landscape of Chamba was pulled down and the present concrete monolith was inaugurated in 1975. The museum is opened from 10 in the morning to 5 in the evening all through the week except Mondays and gazeted holidays. Church of Scotland: Over hundred years old this Church was founded by a mission of Church of Scotland. This Church is remarkable for its fine stone work and buttress and lancer arch windows. The Church was built by its first missionary Father Rev. William Ferqueen in Chamba from 1863 to 1873. Manimahesh Lake: Located in the Budhil valley of Bharmaur at the foot of Manimahesh Kalish, the abode of Lord Shiva, this lake is the highest in the hierarchy of sacred waters of Chamba. 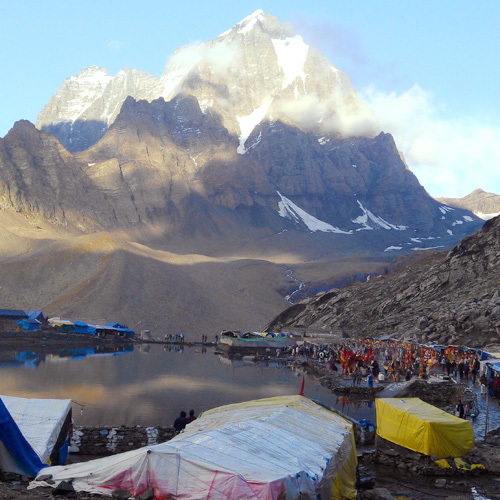 The tarn of Manimahesh is situated at an altitude of about 13,000 feet, 32 23 north and 76 40 east. The tarn is smaller than the tarn of Khajjiar Lake but is the most sacred. It is a great source of pilgrimage and pilgrims from far and wide assemble for a holy dip here.